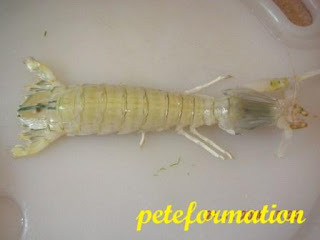 PeteFormation Foodie Adventure: This is how a Mantis Prawn (Mantis Shrimp, Squilla Mantis) looks like – How to clean and remove shell (carapace) for cooking. This is how a Mantis Prawn (Mantis Shrimp, Squilla Mantis) looks like – How to clean and remove shell (carapace) for cooking. I posted a Deep Fried Mantis Prawn dish earlier and some of my readers have not seen a live mantis prawn before, so I am publishing the picture here. There are around 400 species of mantis shrimps in the world and the most common ones you see is Squilla Mantis or in Cantonese ‘Lai Lui Har’(Hokkien, Heh Kor). Actually mantis shrimps do not belong to the Shrimps family. It got its’ name from the mantis like look. At a glance, it sure resembles an extra terrestrial creature with hard armored like carapace. Mantis prawns live in rock cavities or burrowing themselves in the seabed. During low tides you can actually see their burrows and an easy way to spot them is by looking for a lump of mud on top of it. As mentioned in my post, Deep Fried Mantis Prawn, I used to dig for mantis prawns at the seaside when I was a kid. It was fun catching and cooking this nice tasty shrimps. Some mantis prawns can grow to around 1 foot in length and they are aggressive creature. They will chase their prey and literally tear them apart with their powerful claws before eating it! I have got a nasty bite from a mantis prawn while catching it and the claw made a hole through the flesh between my thumb and index fingers. It managed to escape and left the claw still attached to my hand! I have to get my friend to prise open the claw from my hand! LOL! The side of the carapace has sharp thorns, so you must be careful when removing the shell. If you are cooking the whole shrimps, it is advisable to cut away these sharp thorns. To separate the thorns from the flesh, cut along the side carapace of the shrimps around the whole shrimp. Then start from the head, peel out the carapace. Then remove the flesh slowly so that you will not break it. 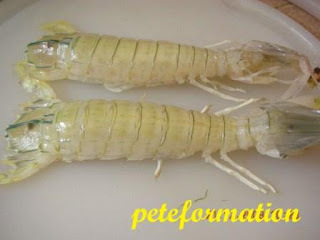 Mantis shrimps taste good if they are steamed whole with ginger and wine, fried kung po style or just deep fried in flour. I love mantis.. and the last time i cooked this was a few years ago, i remember cutting my hand when i tried to peel off their shells.. yes, that shows how often i cook, right? tonight i be cooking something but very simple.. sometimes paiseh to put up also.. hahahaa.. They look extra terrestrial, some say they are extra tasty'real too. Had close encounters with them at steam boat buffet dinners but all seem too small to be enjoyed. So little flesh! So I usually sample a few and grab the more fleshy cousins, medium size prawns! Interesting! Have eaten them before in Sg Petani...but don;t know what it actually looks like! I saw something like that here but lobster like, greyish green in colour - I wander what those are! hmmm, i remember eating those with shell and found it difficult.. maybe there's really some trick to easily get them "naked"?? or maybe those i ate are not fresh?? foot long prawn? what's not to love! hehehhehe.. looks like the sweets i eat. the one where the plastic is edible? u know? I love butter prawn mantis Spagethi..yummy especially the prawn has been fried. waaa quite big leh expensive ar? Hi Pete! Thanks for visiting my site. Nice to know another Malaysian... Ive been to Penang ang KL for three weeks, and how I miss your cuisine, alot... I mean alot!! the Roti Canai and Nasi Kandar and your White Coffee! I made a few blogs about my stay in Penang, and others are still pending. You'll find it under my "Penang Adventure" tags. Hope to hear from you again soon! I shudnt open your blog before breakfast. I am so hungry for mantis now. Wonder what it tastes like. Looks very yummy! Hello, Pete! So nice stopping by your place here and perusing several of your posts. I can see you love to cook and have posted many interesting recipes and instructions. Thank you for stopping by my blog and leaving your comment! Its quite interesting. I have seen them here in Singapore.Some people where catching them in a near by pond. 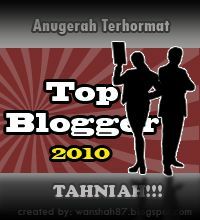 You have an award waiting in my blog.Pls collect it. Love prawns.Taste good in any dish.Thanks for sharing Pete. this is my favorite...one of my favorite seafoods..